Also known as “Hypodermic Sally,” Sally McKenna (Sarah Paulson) is the ghost of a murdered junkie/dealer that resides in the Hotel Cortez. Her appearance is generally disheveled, with frizzy hair, smudged makeup, and ripped tights. She and Iris have a troubled relationship, as Sally caused Iris’ son’s overdose and Iris subsequently pushed Sally out of a window. 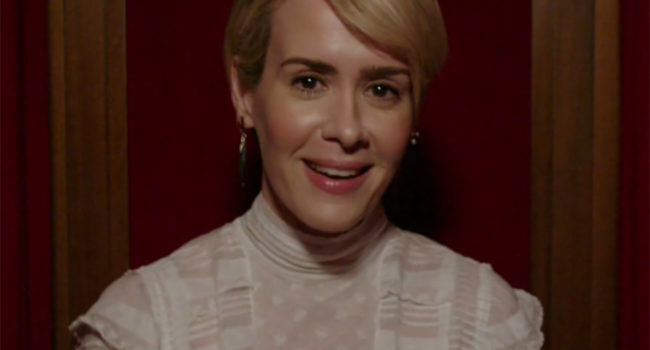 Audrey Tindall (Sarah Paulson) is a high-maintenance actress and newlywed on the latest chapter of American Horror Story: Roanoke. In the series Audrey plays Shelby Miller in a TV reenactment of the harrowing days the Millers spent at a haunted old farmhouse in Roanoke. Audrey does not believe that the events actually took place. Unfortunately for Audrey, she agrees to a TV special in which they all gather back at the house, only to discover that the documentary events were very, very real. This is a guide for her first outfit onscreen as Audrey. As the Headmistress of the witch coven housed in Miss Robichaux’s Academy for Exceptional Young Ladies, Cordelia Foxx (Sarah Paulson) guides her students with a gentle, caring hand in the TV series American Horror Story: Coven. She is the daughter of the former and extremely powerful Supreme, although she and her mother have a strained – and sometimes murderous – relationship. Cordelia, a master of herbs and potions, understands the dark powers gathering against her coven and will sacrifice everything to protect it. This guide is for her outfit after she looses her eyesight, when her clothes change from a mix of white and black to predominantly black.